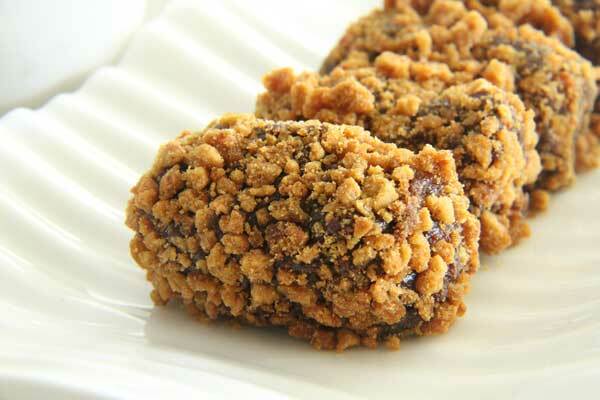 Deliciously Tasty – Gluten, Dairy & Egg FREE snack. Nothing goes together like Date and Gingernut – The crispy crumble on outside and naturally sweet centres make these little treats simply irresistible. Get the kids involved too – they will LOVE rolling the logs. To make the gingernut crumb, place a packed of Leda Gingernut Cookies into a food processor and pulse until the biscuits are crumbed but not too fine. Alternatively you can use a bag and rolling pin if you want more control over the size. To make the logs, soak the dates in the hot water for about 10-15 minutes leaving a small amount of soaking liquid if the dates are still slightly dry. Empty into a food processor and run until dates are chopped. Add cacao and rice malt syrup and shredded coconut and continue to process until well combined, stopping to scrape the sides as you go. Form chopped dates into a log and roll them in the Gingernut crumb. Place in the fridge for about 15 minutes then serve. Leda Gingernut Cookies Available in the health food aisle at Coles & larger independent supermarkets.